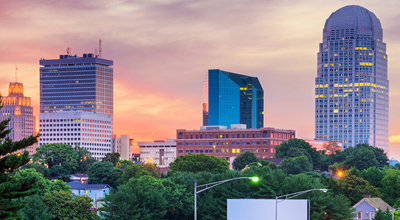 Often referred to as the “twin city” or even the “city of arts and innovation,” Winston-Salem, North Carolina is a city full of rich historical value based on its heritage. This beautiful city is a great place to vacation for all those searching for a scenic trip. One of the best places to visit in Winston-Salem is the Southeastern Center for Contemporary Art. Building on the concept of arts and innovation, this center creates a fun and enthralling atmosphere where all guests can enjoy art in its every form. The Southeastern Center for Contemporary Art was created in 1956 as a non-profit center for the arts, and to this day represents art in every form it comes in. Artwork, music, and theatrics are the focal points of this center. The goal of the Southeastern Center for Contemporary Arts is to create a platform for local artists to make themselves known on an international scale, which promises to make each visit there worthwhile. There are many exhibitions on display at this center which stand to create a deeper understanding of the culture and diversity of people. The Prove You’re Not a Robot Exhibit stands to create an artistic view of the Google reCAPTCHA images. Not only does this exhibit provide each viewer with a different perspective of the concept, but it also presents an educational insight on the use of these reCAPTCHA images. There are programs available at the Southeastern Center for Contemporary Art. Many of these programs feature musical or theatrical performances. Film festivals are also frequently hosted here. The collaboration of artists together to celebrate and present their work is what this center focuses on, and part of what makes each exhibit so unique. More information on these programs can be found here. Located near the Reynolda Gardens-Wake Forest, the Southeastern Center for Contemporary Art is open from 10 a.m. to 5 p.m. on Wednesday, Friday, and Saturday. On Thursday the center is open from 10 a.m. to 8 p.m., and on Sunday from 1 p.m. to 5 p.m. Admission is free for all who visit this center. While exploring the Southeastern Center for Contemporary Art, enjoy your stay at the Hawthorne Inn and Conference Center. Located conveniently within 3.7-miles of the hotel, the Hawthorne Inn and Conference Center offers the best rates when you book directly at: www.hawthorneinn.com.